My new article is up on PopMatters: Finding Room to Learn in Video Games. This article sprung into my mind because I happened to play Pandemic after reading Planet of Slums by Mike Davis. Harper's accurately describes the book as "terrifying." If you have an interest in the living conditions of an ever-growing proportion of the urbanized world, I highly recommend it. Cities like Kinshasa, Delhi, and São Paulo come up again and again - the same cities that are centers of disease outbreak in Pandemic. 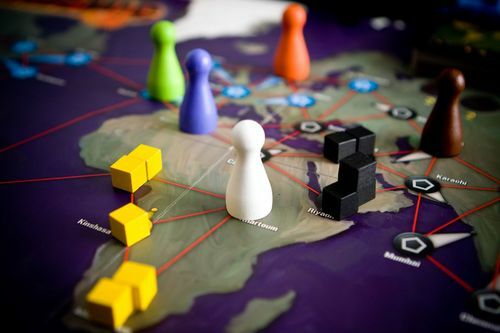 It seems only natural that Pandemic could include more information about the actual conditions that make a city and a population particularly susceptible to epidemics. Of course Pandemic is not explicitly an educational game made by the CDC. However, not only could the extra information improve the tone of the game for those reading it, but it could help make the world a better place. The post does not, in any way, discuss actual educational game design. That is a subject far more worthy of intricate study. In fact, I specifically wanted to steer away from talking about learning conveyed through game mechanics and game systems. My goal was to show that games have room for learning even when its just optional information in the form of text. I do not believe Pandemic, which is an incredibly fun board game, would be any less compelling if it came with a page or two of additional information about the spread of diseases, be it on a separate piece of paper or on the playing cards themselves. In fact, I can think of few games that would be weakened by the addition of real world knowledge. Of course such information can make a game dated or come off as didactic. It can also be an unnecessary expense. That being said, shrugging off a chance to teach something real and important, especially when it can make a game more evocative, seems foolish.